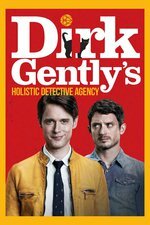 Den of Geek - With a climactic sequence that gave us chills, Dirk Gently’s Holistic Detective Agency proves its emotional depth and ability to inspire. I got all weepy at the happy/truth-spell to Rowdy 3 rescue sequence. I thought maybe Amanda was going to pull Bart through the well to kill all the knights, so glad it was the the Rowdy 3 instead. I suppose it's vain to hope that Sheriff Hobb isn't dead, considering the season 1 body count, but I do hope it. Bart's picture of Panto. I love that we're getting to see silly childlike wonderment out of Bart . I started crying when Hobbs deputized Farah. I need to rewatch the episode before I comment further. I’m with y’all. The last 15 minutes of this show went from joy to fear between the dance party/truth-spell, rowdy 3 reunion, to the fate of sheriff Hobbs. Definitely better than the first season.